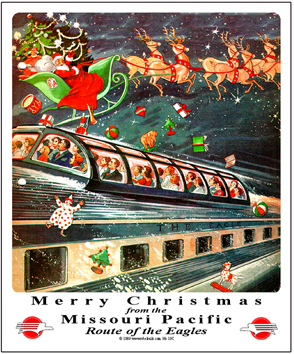 The Missouri Pacific Lines operated fast Eagle passenger trains throughout the mid-West to Pueblo, Colorado. Their Cerulean Blue & White paint scheme was a site to behold. 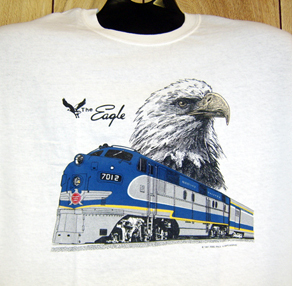 The Missouri River Eagle served St Louis, KC, Omaha & Lincoln; Colo Eagle served St Louis, KC, Wichita, Pueblo, Colo Springs & Denver; Delta Eagle served Memphis, Helena & Tallulah; TX Eagle served St Louis Gateway & Principle TX cities; Valley Eagle served Houston & Brownsville; Nueces Eagle served Houston, Corpus Christi; Sunshine Eagle served St Louis, Memphis & principle cities of TX, LA & ARK. Products bearing individual marks are licensed marks owned by Union Pacific Railroad Company and are used under an active license agreement. 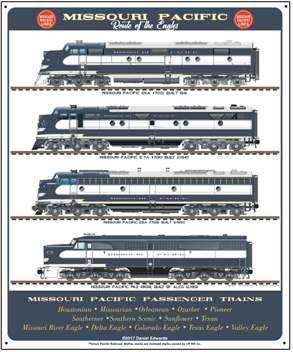 Presenting the Missouri Pacific Railroads famous EAGLE passenger train, powered by a beautiful EMD E-unit diesel. 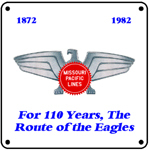 This is the beautiful Colorado Eagle of the Missouri Pacific Railroad. A special Colorado Eagle logo was used on its nose. 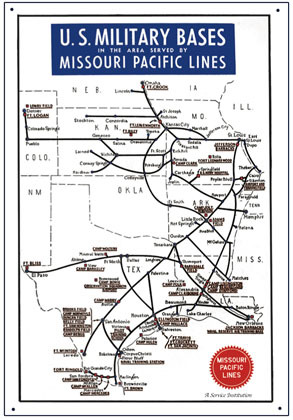 The Missouri Pacific Railroad operated a fleet of Eagle passenger trains throughout Americas mid-west from St Louis to Colorado, Texas and points in between. 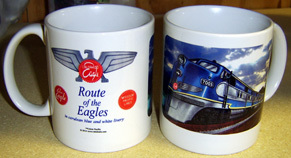 Coffee Mug featuring Missouri Pacific Railroads magnificant Eagle logo superimposed over the paint scheme of its diesel locomotives. A very unique way to present the railroads logo. 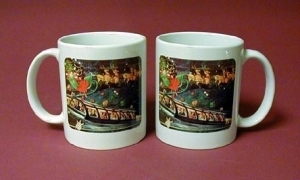 Coffee Mug featuring the Missouri Pacific Railroads N73 Class, 4-8-4 duel service steam locomotive. Served equally well on fast passenger trains and heavy freights. 6 inch x 6 inch square tin Buzzsaw logo sign of the Missouri Pacific Railroad. 6 inch x 6 inch square tin sign of the Missouri Pacific Railroads famous and beautiful Colorado Eagle logo. 6 inch x 6 inch square tin logo sign of the Missouri Pacific Railroads flying Eagle logo. A very unique image of a once proud railroad. 6 inch x 6 inch square tin logo sign of the Missouri Pacific Railroads Kay See Flyer logo. A very unique image of a turn-of-the-century passenger train logo. 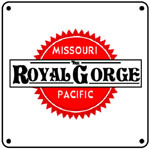 6 inch x 6 inch square tin logo sign of the Missouri Pacific Railroads Royal Gorge passenger train logo. 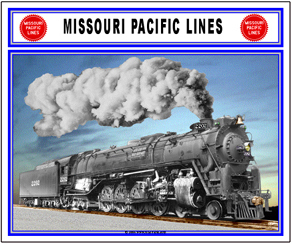 A very rare image for the St Louis to Pueblo connecting train that replaced the Scenic Ltd..
6 inch x 6 inch square tin logo sign of the Missouri Pacific Railroads beautiful Silver Eagle used on the front of their passenger diesels and as the drumhead on their observation cars. 6 inch x 6 inch square tin Texas Eagle logo sign of the Missouri Pacific Railroad. 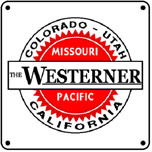 6 inch x 6 inch square tin logo sign of the Missouri Pacific Railroads Westerner passenger train logo. A very rare image of a turn-of-the-century logo. 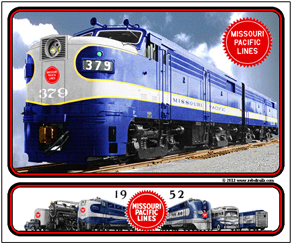 Missouri Pacific Railroads beautiful Cerulean Blue and white color scheme is shown here on new ALCO FA freight diesels. A collage of MoPac equipment used in 1952 is displayed under the FA. 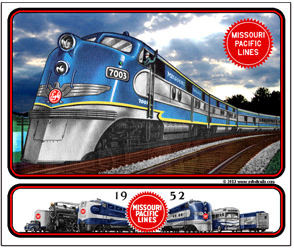 Missouri Pacific Railroads beautiful passenger E-6 diesels decked out in Cerulean Blue and white color scheme raced across Americas Mid-West pulling flagship Eagle Passenger trains. Pad Features a collage of MoPac equipment used in 1952. 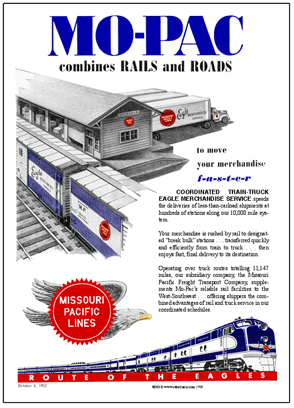 Missouri Pacific Railroads beautiful passenger E-unit diesels decked out in Cerulean Blue and white color scheme raced across Americas Mid-West pulling flagship Eagle Passenger trains. 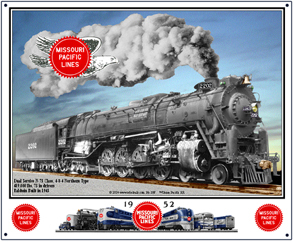 Missouri Pacific Railroads beautiful dual service 4-8-4 Northern Type, N-73 Class steam locomotive number 2202. 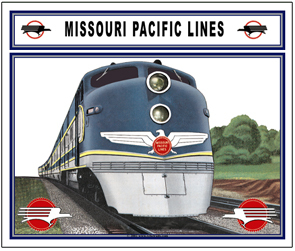 Reproduction Missouri Pacific 100th Anniversary tin sign issued in 1951. 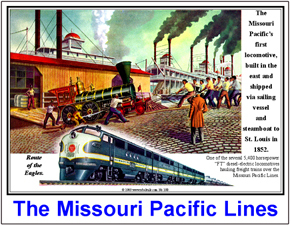 Reproduction of an advertisement of the Missouri Pacific Railroad receipt of its first new FT diesels. 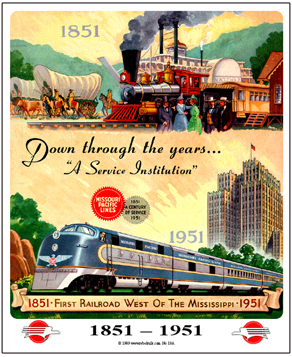 Nostalgic tin sign of an ad ran by the Missouri Pacific Railroad in 1952 promoting its rail and truck services. 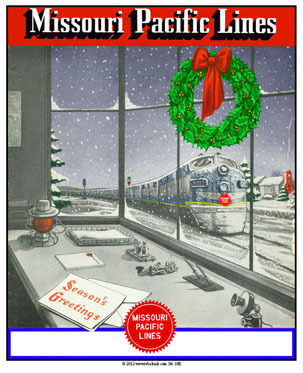 Reproduction of an ad ran by the Missouri Pacific Railroad during the 1941 World War II build up of military bases on or near its line. A very interesting slice of American WWII history. 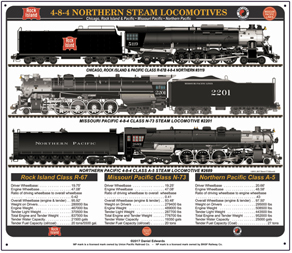 A beast of an engine, the Missouri Pacific Railroads dual service N-73 Class, 4-8-4 steam locomotive.